As the use of child soldiers continues to proliferate throughout the world, effective psychosocial interventions must be developed and evaluated. 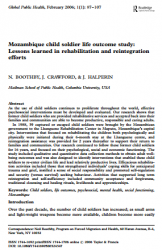 This research, set in Mozambique, shows that former child soldiers who are provided rehabilitative services and accepted back into their families and communities are able to become productive, responsible and caring adults. In 1988, 39 captured or escaped child soldiers were brought by the Mozambican government to the Lhanguene Rehabilitation Center in Maputo, Mozambique’s capital city. Interventions that focused on rehabilitating the children both psychologically and physically were initiated during their 6-month stay at the Lhanguene centre, and reintegration assistance was provided for 2 years thereafter to support their return to families and communities. This research continued to follow these former child soldiers for 16 years, and focused on their psychological, social and economic functioning. The study included qualitative and quantitative data collection methods to obtain adult wellbeing outcomes and was also designed to identify interventions that enabled these child soldiers to re-enter civilian life and lead relatively productive lives. Efficacious rehabilitation activities included those that strengthened individuals’ coping skills for anticipated trauma and grief, instilled a sense of social responsibility and promoted self-regulation and security (versus survival) seeking behaviour. Activities that supported long term reintegration and self-sufficiency included community acceptance and forgiveness, traditional cleansing and healing rituals, livelihoods and apprenticeships.